Photo courtesy of Wendy George. 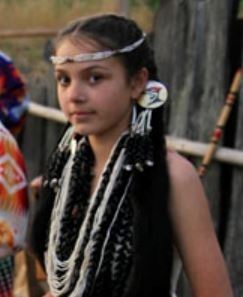 The Hupa, also spelled Hoopa, are a Native American people who predominantly reside on the Hoopa Valley Reservation in northwestern California. The Tribal Reservation headquarter is in Hoopa, California which is northeast of Eureka, California. Traditionally, the Hupa believed there was a person who represented the region east, west, south, and above with mortals known as Kihunai. The underworld is the abode of the dead. Their creator or culture hero, Yimantuwingyai, dwells with Kihunai across the ocean toward the north. The Hupa have revived the Flower Dance, which is held annually. Many believe the Flower Dance ceremony changes negative perceptions about women — a positive way to honor the transition of a girl becoming a young woman. The majority of Hupa are more concerned about secular issues in life than religion in general even though they may claim their traditional religion or Roman Catholicism as their religious preference. Three evangelical churches (a Baptist, Presbyterian, and Assembly of God) are engaging the Hupa people. See Hoopa Tribe facebook page. Pray that Hupa Christians will boldly and unashamedly share their faith in Christ with other Hupa and also other unreached peoples. Pray for Hupa Christians to grow in their Christian faith, becoming disciples who are making disciples.